Our previous post on Creative Painting and our last eNewsletter mentioned Phyllis Gibbs' presence at the show in our booth. Sadly, Phyllis was unable to attend at the last minute. We missed her greatly and send our best to her. 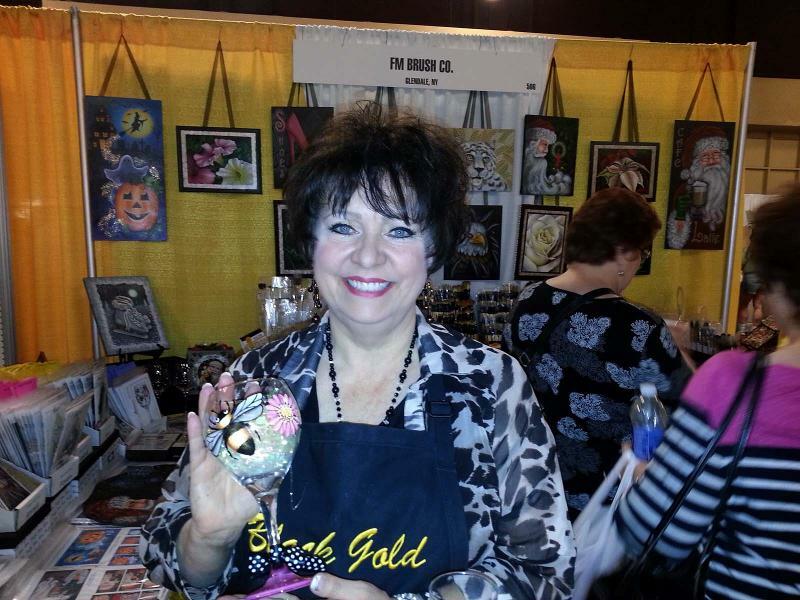 We just returned from the Las Vegas Creative Painting Convention. It was so great to see many of you there. It was a very busy show with lots of demonstrating and classes going one. When I, Jillybean Fitzhenry, was demostrating, people most wanted to see how to use the Black Gold Fan-Dango brush for Santa beards and feathers, Whale's Tail brushes for palm trees and Glass Art Brushes for painting on wine glasses. Angle wave brushes for Zebra fur and pine needles were also of great interest. 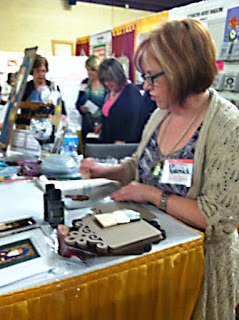 Also of note, Dynasty's new Palmer brushes were a big hit when demonstrated by Deb Antonick in the FM Brush booth in Vegas. People loved the way she used the Bristle Palmers to do her quick and easy backgrounds as well as stippling snow and snowmen. Palmer Brushes are available in both Bristle and Synthetic, 1" and 2" and in a variety of styles. You'll love the way they fit so comfortably in your hand. Watch a short film clip on You Tube for more information. Thank you to all the wonderful teachers that used Dynasty Brushes in their classes at the Vegas convention: Glenice Moore, Bill Bayer, and Christine Taylor-Leonard just to name a few! 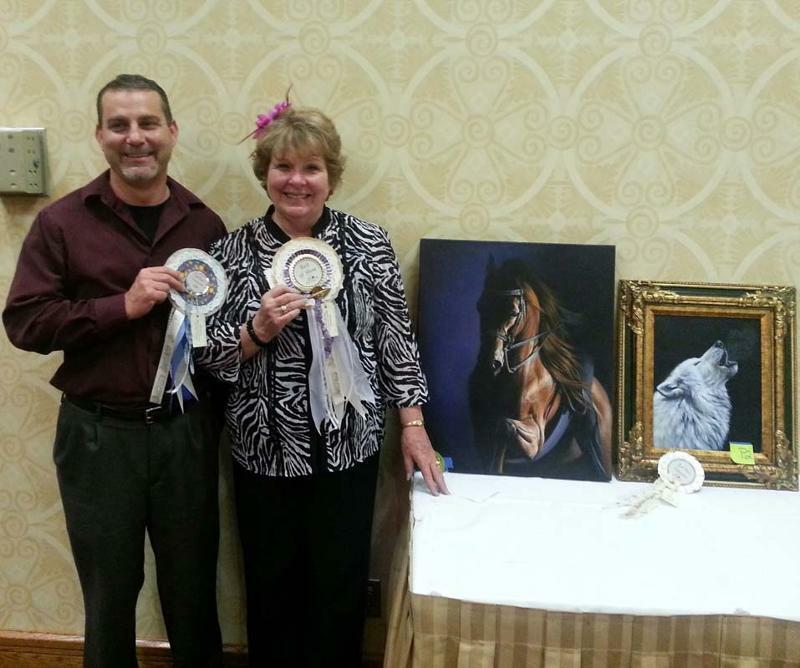 Glenice is shown here with her son Tim proudly holding her 1st place and best of show ribbons from a previous convention. If you are a convention or travel teacher and would like to join our Dynansty family of artists, please contact me, Jillybean, for more information. (Click on my name below.) We can help you with special teacher discounts on brushes for your classes and Pay for Publication articles. Wonderful post.........so nice to see Deb Antonick!!! My dream would be to one day get to a convention! Sure thing, Marilyn. We are working to create more videos on all of the brushes. Are there any in particular you'd like us to prioritize? Thank you for writing; I sincerely apologize that I didn't get to your comments until today. Please reach out via email if you have the desire.